The weather, yep, didn’t clear up overnight. As we looked out our little window onto the terrace at Cabane Louvie, it was dripping and cold. The cabin guardiene had updated the weather to be angry rain in the morning followed by sullen rain in the afternoon. 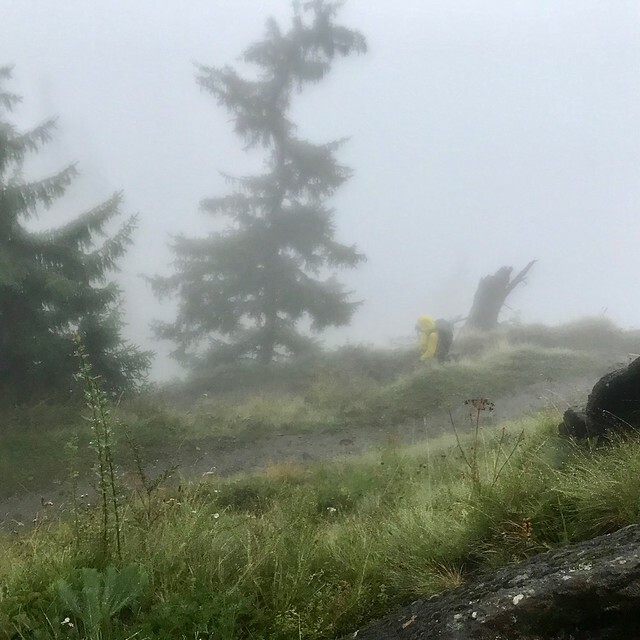 Were we really going to hike seven hours/14km/1200m uphill just to see the mist change into rain change into snow showers? Hell no. So we gobbled down breakfast and headed down the hill to the bus stop in Fionnay, and figured we’d find something in Sion or something, it’s a Saturday after all and there’s gotta be cheap business class hotels. The hike down was a soggy but quick 4km walk, dropping some 800m to the small hamlet of Fionnay. Fionnay had been great in the 1950s when the hydro scheme was put in, but was declining, not sure of it’s place in the world, I’m pretty sure that Make Fionnay Great Again would be laughable and not achievable. 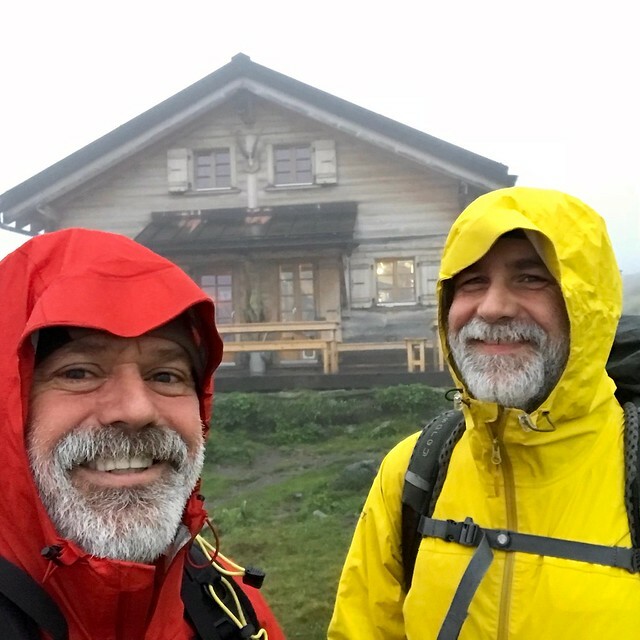 It reminded both of us of the sad declining towns we’ve seen in rural America or Japan, lots of homes with weeds growing on the roof, storefronts for rent or sale, empty driveways with no cars. But this being Switzerland, with the wealthiest people in the world, they still had clean (and heated) public restrooms that I could use to change out of my soggy clothes, and several-times-a-day bus service down the valley to the main city below, Martingny , which we had seen often the past few days in the wonderful sunny weather. Martigny was not sunny. It was cold and windy and a bit bleak. But we had sorted things out as to where to stay. First we cancelled the (non-prepayed) reservation at the hotel under the barrage Dixence, where we were supposed to walk to (because the arrogant staff at Cabane Prafleuri were jerks and just went ahead and had recently cancelled our confirmed reservation). Maybe we could find a cheap and decent hotel up the train line in Sion, the capital of Valais canton. 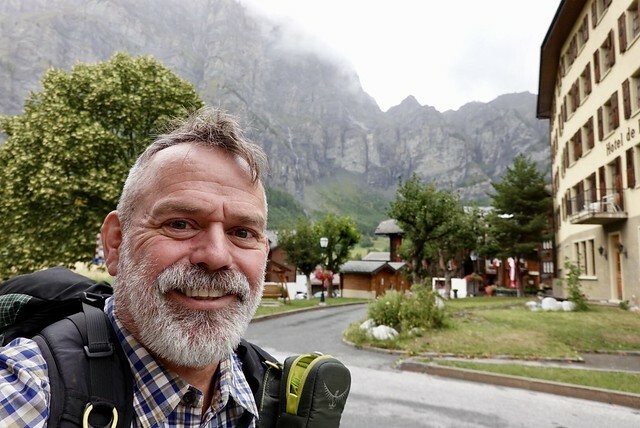 We were thinking we could putter around Sion for the evening, then head back to the trail in the morning to the Barrage Dixence and walk to our next cabane. In Sion, we had some time to fart around—what to do? Maybe go over towards the pedestrian/shopping zone? Sure. We walked by a firetruck that had squirted out foam down the middle of a street (what?) with some not-quite-hunky firemen and one firelady lolling about, then another firetruck a few dozen meters later with buckets and mini-houses and more NQH firemen and the firelady... and parents and cute kids in teeny firefighter gear, having some “Fire Safety Day”. The kids were having a great time, and so were we, it was sunny and cool and relaxed and things were more than all right. Further up the street we spotted a little tent in front of an oeneteca (well, that’s what I called it) and shimmied up to the barrel tables; yeah it’s only 11am but brunchies sounds good. We sampled some local rose and whites and ate the cheese and sausage platter, and watched (shhh) some of the NQH firemen and a couple hunkier ones pay for little samples with 100 franc notes. After our brunch, we scooted back to catch the 12-ish train to Leuk. 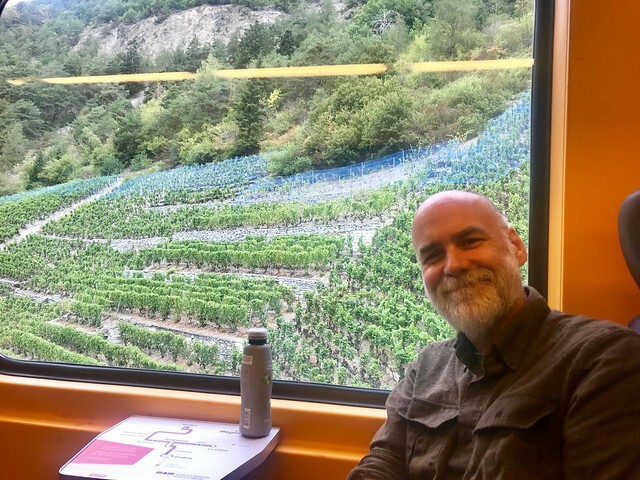 We were amused that the first stop was announced in French (St-Leonard), the second in both French and Swiss German (Sierre/Siders), and our stop was the Leuk bahnhof. A quick transfer to the bus up the hill and we were in Leukerbad. Leukersbad is a dramatic setting! Leukerbad is quite the setting, the town is under huge 500m high cliffs, with a gondola going up to somepass, and a compact walkable center. We strolled to the hotel, dried up, did some tiny laundry, and went over to the spa to lounge in the warm warm waters, filled the Russian couples and the German marrieds and the Korean kids practicing their English. 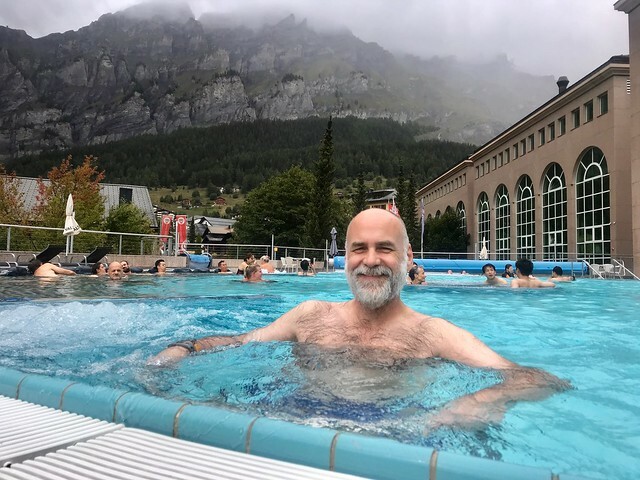 It was charming and relaxing; we sat in the in-pool lounges with the bubbles and watched the snow fall on the cliffs far above and enjoyed our warmth. Dinner was a fantastic six-course spread, not-quite-old-school, and the wonderful hotel manager, dressed in a fantasticly chic dress and blue heels and a flowing mane of silver hair tied back in a ponytail, made us feel warm and happy and welcome. What is it with Swiss hotels? They all seem to know the hospitality game down cold. We tottered off to bed fairly early. A really good and unplanned and unexpected day.